Following a sold out 2018 tour, Love Actually will once again be screened live across the UK with a full orchestra performing its enchanting score – just in time for Christmas! Love Actually, the seasonal romcom that has become a revelation and synonymous for so many with the festive period, will tour the UK this winter with a full orchestra performing its soundtrack live to picture, in what is becoming an annual highlight of the holiday calendar for many across the country. Kicking off the holiday season and getting many into the spirit, the Love Actually Live Concert Tour will begin in Exeter in November, before touring the length and breadth of the country, including a huge show at London’s Hammersmith Apollo on 1st December, before culminating in at Birmingham Symphony Hall on 15th December. With the film becoming a Christmas tradition for many, audiences attending the Love Actually Live Concert Tour will be treated to a unique way to watch the film that has gotten so many into the holiday spirit for the last 15 years. 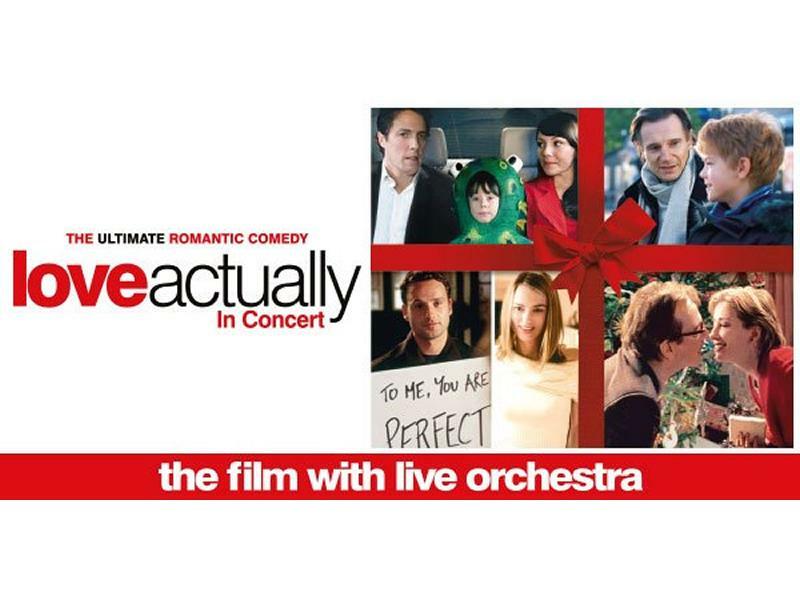 While we take every opportunity to ensure the details for Love Actually with Live Orchestra are accurate, we always advise that you contact the event organiser before setting out for the event to avoid disapointment. MCR Pathways is a mentoring programme which supports secondary aged care-experienced & disadvantaged young people by connecting them with mentors. Join them for their annual conference on April 18th. Critically acclaimed The Simon & Garfunkel Story returns to Glasgow Royal Concert Hall on April 19th... get your tickets fast as this is an evening not to be missed! Grammy-nominated singer, songwriter, and composer Rufus Wainwright brings his ‘All These Poses Tour’ to the Glasgow Royal Concert Hall on Thursday 25th April! Rumours Of Fleetwood Mac, the world’s ultimate homage to Fleetwood Mac, return to The Glasgow Royal Concert Hall with their 50th anniversary tour! Katherine Jenkins OBE has announced a string of UK dates for her 2019 tour 'An Evening with Katherine Jenkins' including a night at The Glasgow Royal Concert Hall on May 2nd! Don't miss George, a celebration of the songs and music of George Michael featuring Rob Lamberti and The National Philharmonic Concert Orchestra, at Glasgow Royal Concert Hall on Friday 3rd May! 80's Symphonic Live is an 80's pop spectacular featuring original vocals and hit videos backed by a full symphony orchestra! Don't miss it at Glasgow Royal Concert Hall on Friday 10th May! Join award winning singer and songwriter Clive John at the Glasgow Royal Concert Hall for the Johnny Cash Roadshow, the UK's No1 celebration of Johnny Cash! The Elvis Years is an outstanding musical production which brings to the stage the incredible and compelling story of the 'king of rock and roll', catch it at Glasgow Royal Concert Hall on May 19th! British electronic pop singer Dido will play Glasgow Royal Concert Hall, her only Scottish show, as part of her comeback world tour! Kelly Jones, frontman and creative force of Stereophonics for over 22 years, is heading out on a solo tour, catch him at the Glasgow Royal Concert Hall on Sunday 2nd June! The world's most iconic dance brand, Ministry of Sound, proudly presents the world premiere of The Annual Classical, an orchestral reimagining of the best selling dance music compilation series! Watch Aljaž Škorjanec, Giovanni Pernice and Gorka Marquez, giants of the ballroom and Latin world battle it out on the dance floor when 'Here Come The Boys' arrives in Glasgow! John Barrowman will kick off his Fabulous Tour in his hometown of Glasgow on Tuesday 18th June at the Royal Concert Hall! Get up close and personal to Rangers legend Paul ‘Gazza’ Gascoigne at The Glasgow Royal Concert Hall on Saturday 3rd August! Belinda Carlisle brings her Runaway Horses 30th Anniversary Tour to the Glasgow Royal Concert Hall on September 22nd 2019! With the release of his new album Wasteland, Baby! around the corner, Hozier has announced a run of 14 headline UK dates, including a night at Glasgow Royal Concert Hall! ‘Nashville Live’ at Glasgow Royal Concert Hall will transport you right into the heart of downtown Nashville, celebrating the atmosphere and energy of an evening in the home of country music! See Aled Jones and Russell Watson, two of the world's greatest classical voices, at Glasgow Royal Concert Hall as part of their In Harmony tour! Ireland's No.1 Country Singer Nathan Carter returns to Glasgow Concert Hall with his Born For The Road 2019 tour on Friday 11th October! Experience the thrills, kills and loves of James Bond through this hit show of iconic music performed by powerhouse live orchestra when it comes to the Glasgow Royal Concert Hall! Squeeze have announced a 2019 UK tour which includes a night at the Glasgow Royal Concert Hall and includes special guests HEAVEN 17! Lisa Stansfield has announced a date at the Glasgow Royal Concert Hall as part of her 2019 tour, marking the 30th anniversary release of her debut solo album 'Affection'! Orchestral Manoeuvres in the Dark will continue their 40th anniversary celebrations with a special world tour, catch it at Glasgow Royal Concert Hall on October 31st! NOW! That's What I Call The 80s Live is coming to The Royal Concert Hall Glasgow on Sunday 24th November! Kids will enjoy a special screening of 'Ernest & Célestine en hiver' at the Alliance Francaise Glasgow on Friday 19th April!